After logging in you get the following welcome screen. After the installation if you want to access webmin from any machine in your network edit the /etc/webmin/miniserv.conf file. If you want to restrict webmin access to your network or a particular computer, you can also do that here. After changing the setting you will need to restart webmin. 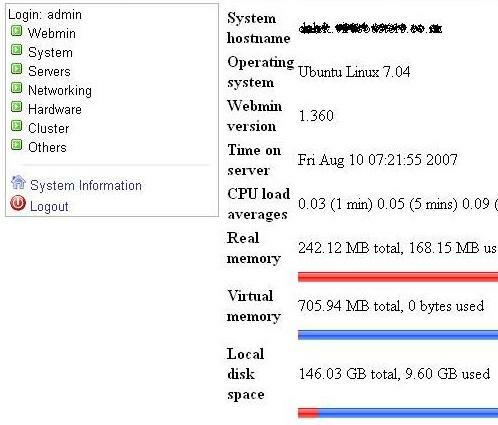 Some people prefer not to use webmin as they feel it adds extra overhead and takes up too much memory. The average modern server is unlikely to notice webmin but as it does not need to run continuously. If you need it it is a handy tool to have but after you have used it you can always shut it down when it is not needed. This ensures it doesn't use any extra processor cycles or memory if your server is running hard already.